Barnsley being landlocked and not a particularly well known site for war industries escaped attack in WW1 from the Germans. We know a Zeppelin passed over Silkstone in November 1916, and a description of this event can be found in Tim Lynch's book "Yorkshire's War". Happily no-one was killed or injured as a consequence. 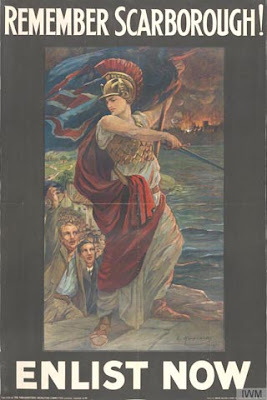 The safety of Barnsley connected civilians who lived and worked in seaside or industrial towns, or who were undertaking journeys through theatres of war was not so readily assured. The first civilian death that I am aware of occurred during the German bombardment of the east coast on 16 December 1914. Such an attack on British home soil was so without precedent and deaths and injuries to non-combatants, including women and children were so shocking at that time, that images based on the event were used in recruiting posters, like this one on the right. Margaret Briggs was born in Holmfirth on 7 October 1884 according to the information recorded on her baptism register entry and in the family's census entries. She and her younger sister, Mary Ann, were baptised at the same time, 7 July 1889, at St Margaret's church in Horsforth. Margaret's parents, Samuel b.1859 in Pontefract, and Margaret (maiden surname Meredith) b.1854 in Much Wenlock, Shropshire, married in Pontefract on 11 January 1880. Samuel's occupation at that point was as a Groom. By 1881 the couple and their three month old son, Thomas, born Wragby, were living in Avenue Cottage at Hill Top, Wragby, which is near Nostell Priory. More children followed, Arthur in 1882 in Wragby, Margaret in 1884 in Holmfirth, Eliza in 1886 in Huddersfield, Mary Ann in 1889 in Horsforth, then George in 1892, Alice in 1896 and Jane in 1897. All the last three were born in Barnsley. I wonder who Samuel Briggs worked for? Did he change employers on several occasions or are the varied birth places of children a reflection of some other reason for moving around West Yorkshire on a frequent basis? In 1891 the family were living at 58 Honeywell Street, Barnsley and Samuel was a Coachman. In 1901 they were at 1 Vernon Street and Margaret and Eliza, who would have been 16 and 14 years of age, are not at home. They appear to be both living in Sowerby Bridge as General Domestic Servants to a Wholesale Drysalter and a Mechanical Engineer respectively. The youngest Briggs child, Jane b.1897, had died in October 1898 aged just 10 months and was buried in Barnsley Cemetery, plot S 384. When she was baptised in January 1898 Samuel's occupation was noted as a Cabman, but in 1901 it is given as Coachman/Groom again. The 1911 census should contain additional information about the total number of children born to a marriage and how many had died and were still alive at time the census was taken. However Samuel and Margaret did not fill in this information so we can't tell if there were any other children, or to double check if the still absent Eliza had died young. Samuel has been recorded as a Cab Driver this time, and the family are living at 11 Sherwood Street, Barnsley. The family remain at this address for quite a long time. Sherwood Street runs parallel to Pontefract Road on the way up the hill towards the Barnsley football ground (click here to see the address on Google Maps). Number 11 is a small terraced house near the top of the street which fronts straight onto the pavement. Happily I found that Eliza Briggs had moved a lot nearer to home and was living at 5 Sherwood Street, just a few doors away, in 1911. Her occupation is given as Domestic Servant, which seems a little odd in the household of a Bobbin Finisher. But maybe she was only lodging there, as the married couple listed, John and Cassandra Shaw, had five rooms (not counting their kitchen) and no children to their four year marriage to occupy their spare bedroom(s). Meanwhile Margaret has moved to Scarborough, where she is a Housemaid to a widowed Solicitor. It is a fairly grand household as there are four servants, a cook, two housemaids and a houseboy. It seems to be the same address where she was killed in 1914. One of Margaret's sisters, Mary Ann aged 25, married on 1 August 1914, just three days before Britain declared war on Germany after their invasion of Belgium. Her new husband was John Wales, a Miner and both bride and groom give their address as 11 Sherwood Street when they marry at St Peter's church on Doncaster Road. This couple move to Normanton which may be where John originated from, before birth of their son John in early 1916. That is not so far away and I am sure they would have returned for future family events such as weddings and funerals. In the Barnsley Chronicle of 19 December 1914 Margaret's death is reported under the headline, "East Coast Raided - Scarbro', Whitby and the Hartlepools Bombarded - Great Loss of Life - Barnsley Woman Amongst the Slain." Some young Barnsley boys were attending school in Scarborough and their thrilling escape from the town on a train to York is fully reported. "Information has reached the town on Wednesday evening to say that Miss Margaret Briggs, a daughter of Mr. S. Briggs, of 11 Sherwood Street, Barnsley, was one of the victims of the German Bombardment. Miss Briggs, who was 29 years of age, was employed as a servant at "Dunollie", Filey Road, Scarborough. She was very well liked by her many friends in Barnsley, and great sympathy will be felt with her relatives. Her father is a very well-known cabman and dog fancier. From all accounts, Miss Briggs was intending very shortly to return to her home, and the tragedy is made all the more pathetic by the fact that she had already sent on some of her luggage in advance. Miss Briggs was killed on the doorstep of the house whilst taking letters from a postman who was also killed. "Dunollie" is one of the most southerly of the buildings hit in Scarborough. The shell struck the gable end of the house nearer the sea, and then appears to have dropped straight in front of the main entrance where Miss Briggs was standing." In 1947 a "Dunollie House" was opened as a Rest House by Rowntrees of York for company employees suffering from stress and ill health. 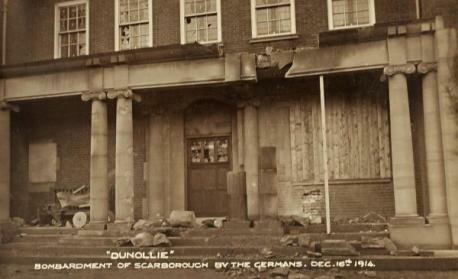 The above photo from their website shows the the damage sustained by the house in the bombardment in WW1. That could be the very doorstep on which Margaret was standing when she and the postman were struck down. Some of the details on their site do not tally with the information on the 1911 census, so I am being a little cautious about this. I also found a short silent film of the actual opening which shows the inside of the house and the opening ceremony in 1947. Margaret's body was returned to her family in Barnsley and she was buried in Barnsley Cemetery on 20 December 1914 in the same plot as her baby sister Jane. There is a mystery child, John William Briggs, aged just 4 months buried in the plot in 1909 from the same 1 Vernon Street address as Jane. His General Register Office entry suggests he was illegitimate as no mother's maiden name was mentioned. I assume one of the older sisters, either Margaret, Eliza or Mary Ann was his mother. A second of Margaret's sisters, Alice aged 19, married in June 1915, again at St Peter's church on Doncaster Road. Her husband was Albert Laughton, a 20 year old fitter and steel turner. I believe they had at least five children together before Alice's untimely death in 1923 aged just 28 years. Albert remarried again to an Ellen Watkins in the June Quarter of 1927. The 1918 Absent Voters list gives information about men who joined the services in WW1 who were expected to be away from home for the election in December of 1918. The register has been transcribed by the Barnsley War Memorials Project and can be found online here and also in paper form on the open shelves at Barnsley Archives. Margaret's middle and younger brother are both in the services in 1918 and have given 11 Sherwood Street as their home address. Arthur is a Private in the 4th (Reserve) Battalion of the York and Lancaster Regiment, he would have been 35 years old. George is a Bombardier in the 286th Siege Battery of the Royal Garrison Artillery, he would have been 26 years old. There is a Thomas Briggs enlisted in the 13th Battalion of the York and Lancaster Regiment a couple of streets away who may be the eldest Briggs brother - but there is no definite proof. I cannot find either of the sisters' husbands listed. The mother of the family, Margaret Briggs (nee Meredith), dies in 1919 and is buried in the family plot in Barnsley Cemetery. At least she would have know that her boys were safely home before she passed away. Husband Samuel joins her there in 1924; both were 65 years old when they died. Just because I can and to try to finish this story off I searched for the Briggs brothers and sisters in the 1939 Register on Find My Past. There was no sign of Thomas, the eldest brother but here is proof that Arthur and George made it home safe from WW1. Arthur, aged 56, is an Air Raid Precaution warden in WW2. Both men are marked as carrying out Heavy Work (H.W.) - I believe this means they were entitled to extra ration points. Unmarried 53 year old sister Eliza is living with them, housekeeping for them maybe? What I assume is a niece, 18 years of age, presumably a daughter of their deceased sister Alice Laughton, is also living with them, maybe they took her in to help out when her mother died? Sister Mary Ann was living in Normanton in 1939 with husband John who is now a Colliery Deputy. Living with them were son John W and one more member of the family whose details are still hidden on Find My Past (details in the 1939 Register are closed if the person died after 1991 and the record has not been unlocked by a relative submitting a death certificate). Both father and son are ARP wardens. Albert Laughton and his second wife Ellen are living at 2 Bala Street, just around the corner from Sherwood Street. He too is a Heavy Worker in a his old trade of turner and borer, which does sound fairly essential for the war effort. I am sure the family remembered Margaret and her shocking death in the German Bombardment of Scarborough for many years and with all the Briggeses buried in Barnsley Cemetery I wonder if there is a gravestone on plot S 384 recording them? One to check when the weather gets nicer again!